I am a boxed brownie girl. Ya I said it. And I am totally not ashamed. I may give you the side eye when you pass me a piece of cake that came out of a box…but brownies? I get it. Any brownie I have ever made from scratch has not tasted any better than the boxed brownies. So why am I bringing you a recipe for brownies that don’t come out of a box? Because I broke down. It only took three little words…Sweet & Salty Brownies. 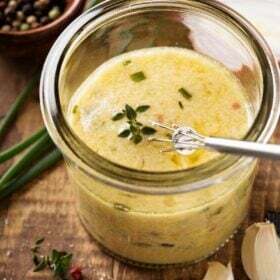 But instead of posting the recipe as they were originally written, I am bringing it to you the lazy girl way. One bowl, prepackaged dulce de leche, and a break for wine. Ok, so first you need a double boiler. What?? You don’t have one? Fine, get a metal/glass bowl and put it over a pot with some water in it. Ya it works exactly the same. Except you don’t get to have a pretty shiny double boiler that fits perfectly. 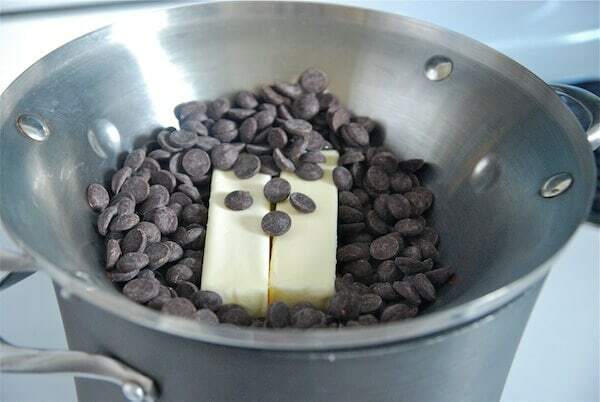 Get the water boiling, then add two sticks of room temperature butter and an 11.5 oz bag of Ghirardelli’s bittersweet chocolate baking chips. What’s that? You are too impatient to let the butter get room temp? It’s cool, just toss it in cold. It’s just gonna take longer to melt. Stir the chocolate and butter around until it melts completely. P.S Go take your 5 eggs out of the fridge now. Crack them into a small bowl and let them come to room temperature while you go on with the rest of the steps. Yes, I know I just told you the room temp thing didn’t matter. But that was butter and now we are talking about eggs. Turn off the heat, but leave the chocolate/butter mixture on top of the boiler. Add 1 1/2 cups regular sugar and 1/2 cup packed light brown sugar. Whisk it around until it’s pretty and smooth. Here comes that wine break I told you about. Once it’s whisked and pretty and smooth….let it sit until it comes to room temperature, about 30 minutes. During this time, I suggest you play a fun game called How Much Wine Can I Drink In 30 Minutes. You made it back? You must not be as skilled in How Much Wine Can I Drink In 30 Minutes as I am. We can work on that next week in my next How-To post, but for now lets get back to the task at hand. Before you do anything else, start preheating your oven to 350 degrees. The next parts go fast. 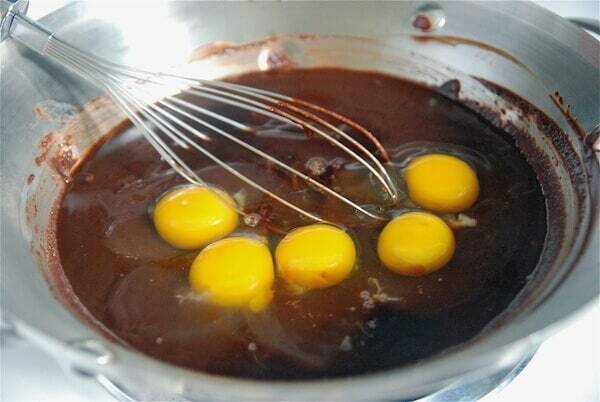 Add all 5 room temperature eggs and 2 teaspoonfuls of vanilla extract. Whisk until just combined. You don’t want to whisk too much because that could harm your drinking hand…or worse, whip the eggs so much that they ruin your brownies. The original recipe wanted us to do the eggs separately. But this is the lazy girl’s way, it won’t really make any difference, and I know you have had too much wine by now to count and whisk 5 separate times. So just make it easier on all of us and whisk all the eggs and vanilla at once. Add 1 1/4 cups flour, 2 tablespoons cocoa powder, and 1 teaspoon salt. Should you mix these dry ingredients in a seperate bowl first? Probably, but I never do…that’s just one more bowl to wash. Just make sure you whisk carefully and don’t get any big lumps. Don’t overmix for fear of splattering chocolate everywhere, and that stupid over beaten egg issue from earlier. Once it’s mixed, pour half of the batter into a prepared baking pan. Grab a squeeze bottle of Dulce De Leche and make a pretty design adding as little, or as much, as you want (and by “as much as you want” I mean like no more than 3/4 of a cup…we don’t want brownie soup). Don’t get too close to the edges with the Dulce De Leche, leave about an inch around the edges. Then pour the remaining brownie batter around on top of the pretty design you just made. Level it out (carefully, so you don’t mess up the layer underneath) with a spatula, or your fingers. Whichever is easiest. Make one more pretty design with dulce de leche. Or instead of a design, write your name so everyone knows these brownies belong to you. Sprinkle on some Fluer De Sel (i.e. fancy flaky sea salt you can buy at Whole Foods or Fresh Market). Pop them in the oven (preheated to 350 degrees) for 30-35 minutes, rotating half way through. Let them cool so you don’t burn off your taste buds, and because they taste much better room temperature, then dig in! Using a double boiler, if you have one (or a glass/metal bowl over a pan of simmering water), melt the chocolate and butter, stirring occasionally, until completely melted and combined. 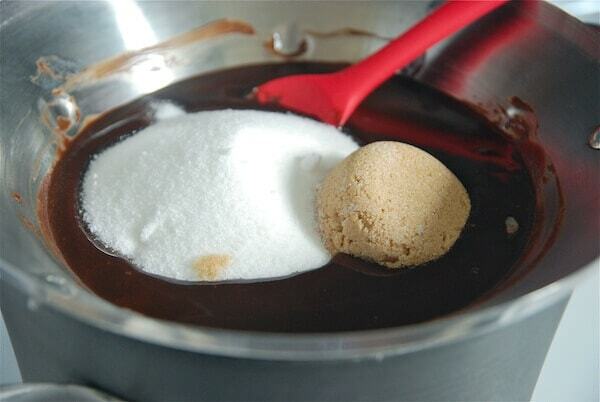 Turn off the heat, but keep the bowl over the water of the double boiler and add both sugars. Whisk until completely combined and remove the bowl from on top of the water. Let sit until it's at room temperature, about 30 minutes. Preheat oven to 350 degrees. Prepare a 13x9 baking pan by buttering the sides and bottom of the pan. Then lining the bottom with a sheet of parchment paper and butter the parchment paper. Or just use some Baker's Joy spray. Add all 5 room temperature eggs and vanilla. Whisk until just combined. Do not overmix, this will beat the eggs to much and ruin your fudge brownies. 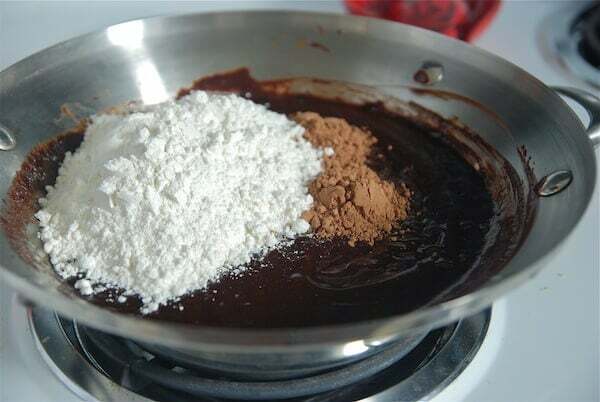 Sprinkle the flour, cocoa powder, and salt over the chocolate mixture. 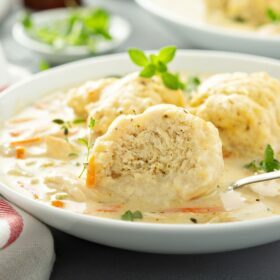 Using a whisk, gently combine the dry ingredients into the wet ingredients until there are no big lumps and you don't see any flour. Again, try not to mix more than needed. 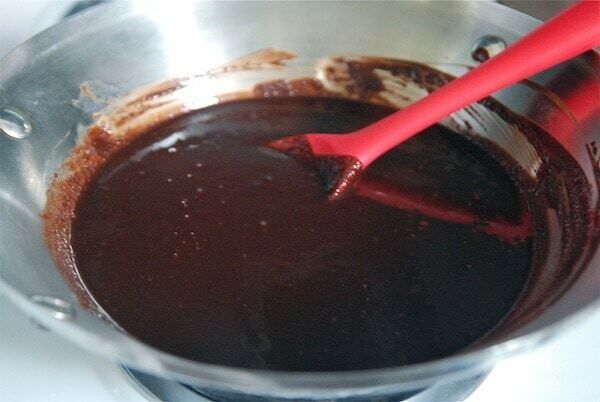 Pour half of the brownie mixture into the pan and smooth the top with a spatula. Drizzle as much, or as little, dulce de leche as you would like (and by "as much as you want" I mean like no more than 3/4 of a cup...we don't want brownie soup). Don't get too close to the edges with the dulce de leche, leave about an inch around the edges. Pour the remaining brownie batter over the dulce de leche layer. Level it out (carefully, so you don't mess up the layer underneath) with a spatula or your fingers. Whichever is easiest. Drizzle a little more dulce de leche on top in a design of your choice. And top it all off with a sprinkling of fluer de sel. Bake at 350, for 30-35 minutes, rotating the pan half way through. Check the brownies using the toothpick method. The brownies are done when the toothpick comes out with a few moist crumbs. Man I love a recipe that doesn’t disrupt my wine drinkin’. I was hooked at salty. Salt + chocolate + wine = perfection! It is very important to make sure that your baking provides adequate wine breaks. 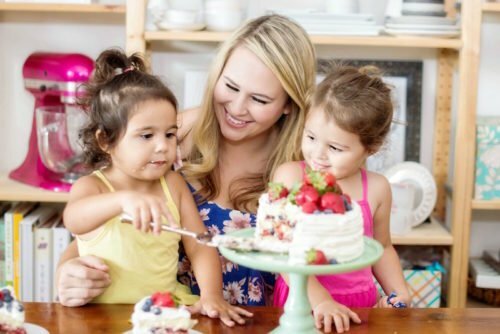 it would be a disaster if you were to get dehydrated during the baking process. 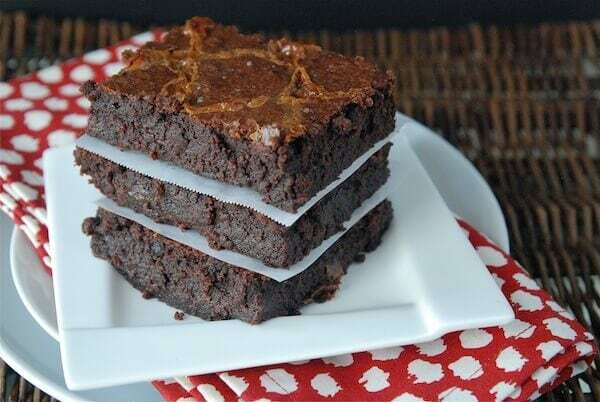 Also these brownies? Just perfect. 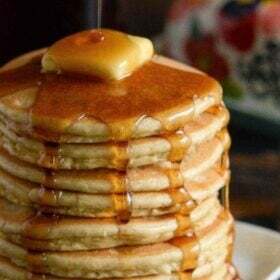 I want about 8 of them right now. These look incredible! I must say I totally disagree with a box brownie tastes the same as a brownie from scratch. 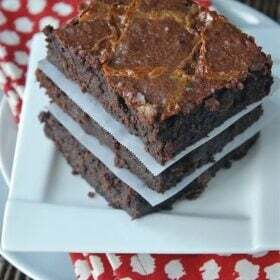 A super easy “scratch” brownie recipe is the “One Bowl Brownie” recipe on the back of Bakers unsweetened chocolate…throw in some good chopped chocolate or chocolate chips and you’re in heaven (and it didn’t take much longer then a box brownie). 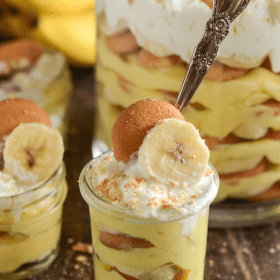 Love this recipe…will definitely try it! the ONLY kind of brownie I like is a fudgy, almost half raw one. Anything cakey, dry, airy, or overbaked…no way. These are perfect. I want. Lots!!! Well look at you and your fancy patterns on top! These look amazing! I also disagree with the box brownies taste better statement. Have you ever made the Brownies Cockaigne from the Joy of Cooking?? They us the same process as this recipe, only 4 eggs, 1 cup of flour, 1 stick of butter, 4 oz chocolate, 1tsp vanilla, 1/4 tsp salt, 2 cups of white sugar (not positive on that amount)…It is definitely key to let the chocolate/butter mixture cool and that you don’t mix the eggs too much. They are fudgy and crackly on top…yummm. These are definitely worth a try, though, with the dulce de leche…thanks for the recipe! And a tip – if you use the “chocobake” premelted baking chocolate, you can simply melt the butter in the microwave and then combine them together – no need to use that extra pot to boil water in and turn on the stove! I have been cooking everything from scratch lately and made a box of brownie mix that was our favorite. No taste, absolutely no taste. I think this is because we have gotten used to eating real food without chemicals etc. This looks like a good recipe. I don’t have a double boiler, but I just use a big bowl that fits right over it. One day I’ll buy the real thing… one day. 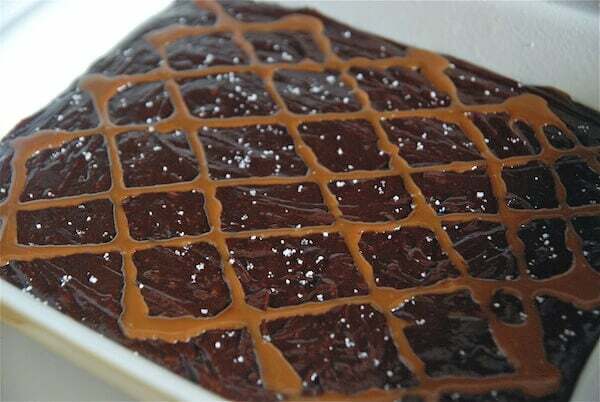 Fudgey brownies are the best and I love the design you made on top with the dulce de leche. You really are the wind beneath my wings! Hello PMS brownies!!! These brownies look perfectly and wonderfully fudgy! Yum!! it was right about then that my boss figured out I wasn’t working. Thanks. You’re too funny. 🙂 Your post made me laugh out loud, and I *just* rolled out of bed, so that says a lot because I am *not* a morning person. Holy mouth ecstasy! Pure. Evil. How Much Wine Can I Drink In 30 Minutes sounds like the best game ever. These brownies are making me drool. This looks absolutely insane. I need it in my life. Gah! These sound divine. And ya know I’m not usually a step-by-step fan but you were cracking me up! I have to agree it is these brownies that made me a homemade brownie believer. I love your quick fix for the caramel in the center! It’s quite the genius idea. Oh, my goodness, I love this lazy way to make brownies!! I actually haven’t had a brownie in a long time – I need to change that asap!! I’m a lazy girl, and need some brownies in my life. Yum. Totally just bought a box of brownie mix the other day… Shhh, don’t tell anyone. 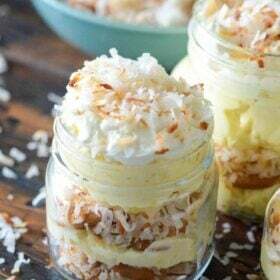 Wow these look decadent! Love the dulce de leche involved – the brownies look so deliciously fudgy. OMG they are so rich. Absolutely fabulous looking! I need one of them at this moment! These look delicious, and I just bought some fluer de sel this past weekend. Awesome! I am so glad you liked them!! When I looked at the online picture I thought you had yummy mint filling between the brownie layers instead of waxed paper. I was getting pretty excited until I zoomed in and saw the paper! My son said these look sooo delish! These look amazing, no one would know that they are easy! 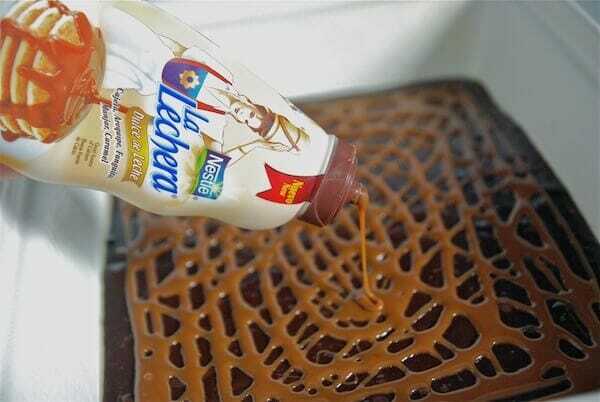 Where do you find squeeze bottles of dulce de leche?! i totally get why you broke up with the box for these! I’ve made a variation of them and they are amazing!! You totally had me when you combined lazy and brownie. Sounds perfect. OMG I am way tooooooooooooo tempted seeing this brownies this morning.. Absolutely perfect and also I am loving ur pictures and browsed thru many of ur recipes which I am love tooo… Gorgeous. 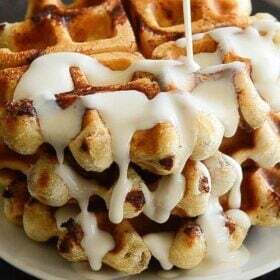 Hmmmm – they look sinfully delicious. This is best for the upcoming Halloween,. Good thing I stumbled upon your blog. 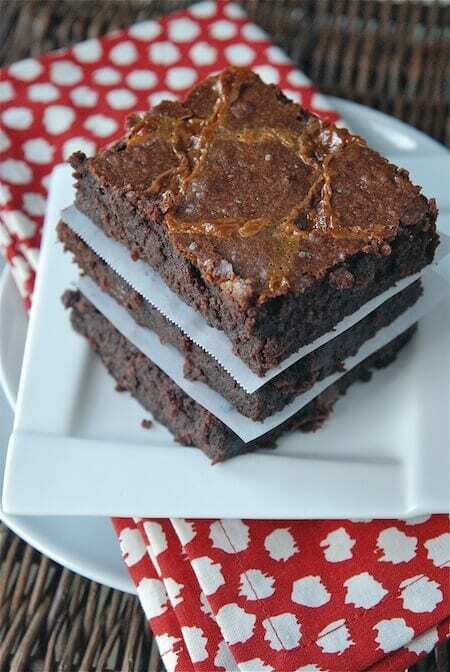 Wow these fudge brownies looks good, I wonder if it`ll be a good idea to make some for my gf this valentine’s day. I hope she does not think I am cheap. Do you think these brownies would still be delicious without the dulce de leche? I’m not a huge fan of that, but I’ve been looking for a good, fudgey brownie recipe! I think these would be! But I am not positive…you could always sub the dulce de leche for some caramel instead! Made these brownies a few weeks ago! O-M-G! They did not last long in our house nor my husband’s work. I always send a bunch of treats to the soldiers he works with and they raved about how delicious these were! 🙂 Just like a brownie is supposed to be full of chocolately fudgey goodness. They were even better the next day. They were PERFECT! I’m gonna try these at some point, but I just had to leave a comment now – love your writing style!